The huge new wind turbines at the Burbo Bank wind farm extension have generated power for the first time. Dong Energy has announced that power from the first turbine is now being exported to the national grid. The extended Burbo Bank wind farm off the coast of Hoylake in Liverpool Bay will have an additional 32 turbines when complete. 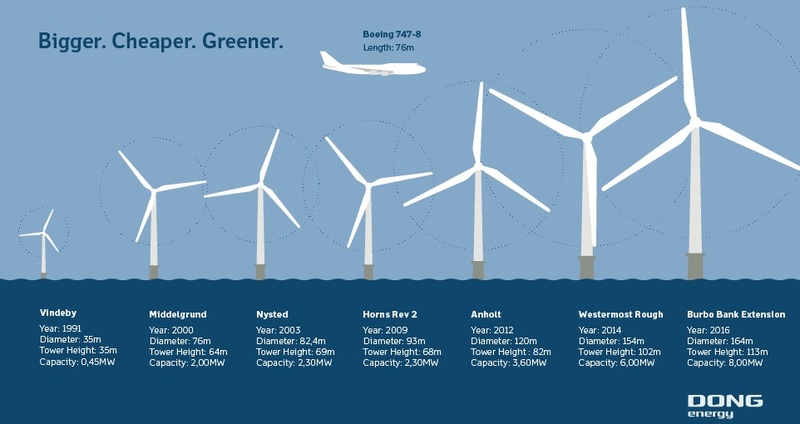 The turbines currently being installed are the largest in the world and stand taller than the Gherkin office block in London. Dong Energy say that once all 32 turbines are in place, expected in the first quarter of 2017, the wind farm will be capable of generating up to 258 megawatts (MW) of electricity – enough capacity to meet the annual electricity demands of approximately 230,000 UK homes. ‘New wind turbines spark into life’, only when it is windy. cold weather produce little or no wind. Largest in the world…. Liverpool leading the way in green energy! Dong Energy is owned by the Danish Government and the American Investment Bank Goldman Sachs. Therefore ‘Largest in the world ………. Denmark and multi-millionaires leading the way in green energy (subsidised by British taxpayers – whether electricity is generated or not).